Break out the barbecue and your red, white and blue apparel—it’s the Fourth of July in the Ocean State, and Rhode Islanders certainly know how to celebrate! If you’re looking for places to be on Independence Day, check out these great fireworks and festivals happening over the weekend. Bristol’s Fourth of July parade began in 1785 and is one of the oldest Independence Day celebrations in the United States. The parade also has a long history with the infamous Providence mayor Buddy Cianci. Though only Bristol officials were meant to walk, he marched through on his horse every year—until he was banned from the parade in the 80s. Each year, the city’s Department of Art, Culture and Tourism hosts a July 4 evening celebration full of family-friendly events and live entertainment. Be sure to catch the free performances from surprise guests and the Air National Guard Band of the Northeast at 7 p.m. Cap things off with a sparkling firework display at 9:15 p.m.! 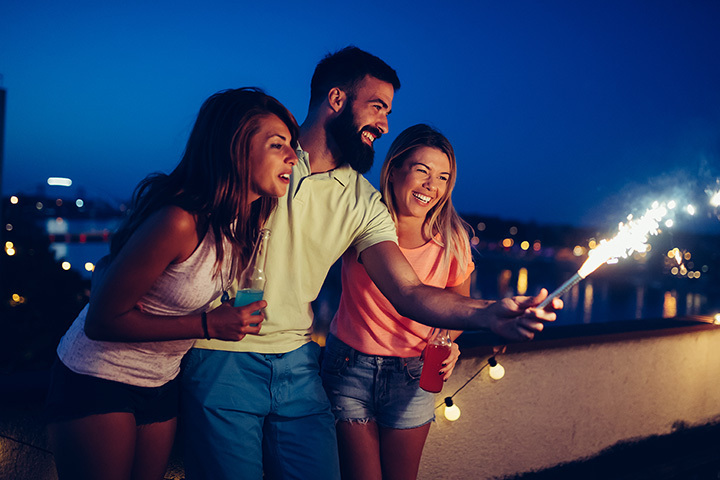 Kick off the celebrating on July 2 with Block Island’s annual firework display, which can be seen from any location on Crescent Beach, Old or New Harbor. Then at 11 a.m. on July 4, check out the “Favorite Movie” themed parade at Legion Park. Join the Newport Historical Society on a walking tour throughout the city, and discover the role it played in American Independence! The tour lasts for 75 minutes, and you should certainly reserve tickets ahead of time! All day long, you’ll find plenty of activities going on in Washington Square. Hang out in the morning to enjoy some jazz and marches, and then catch members of the Rhode Island Society and Sons of the Revolution reading the declaration of Independence from the front steps of the Old Colony House. 6. Sail along Newport to catch the fireworks! What better way to catch the fireworks than while at sea? Bring your own beer aboard the Schooner Adirondack or Sloop Eleanor and hang out on the waves from sunset until the late evening. Kick back some baseball, brews, and buds at your local minor league baseball game! Several nights throughout the summer, including July 2, 3, 7, 14, and 28, the PawSox set off post-game fireworks. This elegant event will make you feel like you’re a member of a prestigious golf club. What’s included in the flat price? The finest seafood including fresh Stonington lobsters, mussels, clams, and clam chowder as well as barbecue favorites served buffet style. Beer, wine, and soft drinks will also be provided. The event takes place on the lawn of the gorgeous Weekapaug Inn. Picture being right on the water sitting around the fire pit toasting s’mores and enjoying all the night has to offer. This is the kind of night you and your loved ones won’t forget! Come for the music and stay for the fireworks! This annual concert invites viewers to bring their own lawn chairs and blankets to watch the nonprofit Lafayette Band. Music usually starts at 7 p.m.! There’s little more patriotic than a concert and fireworks under the stars. This local event is typically held at Bryant University, which provides a cozy setting for America’s annual celebration of freedom and patriotism. This year, the event will be held on Monday, July 2. View more Rhode Island July 4th Fireworks and Celebrations.